Raili, Kendrew puppies have arrived December 27 2018. Seven girls and one boy. There are still three girls available to qualified homes. July 2018, Kendrew makes his debut as a Grand Champion and picks up a Group IV placement under judge Rick Fehler at Cold Lake. Welcome to the home of Sassenach Gordon Setters. Established in 1981, Sassenach prides itself in producing Gordons with sound minds in sound bodies. 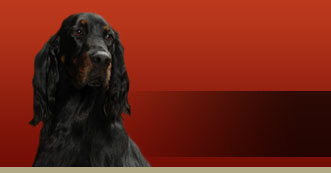 We strive for healthy Gordon Setters that have wonderful temperaments and will be versatile enough for whatever their new owners wish. Whether that means the show ring, obedience, hunting, rally or companion they should be able to participate as members of their family and be a credit to our wonderful breed. Sassenach kennels are located in the foothills of the Rocky Mountains in Southern Alberta, Canada. All our puppies are raised in an environment that gives maximum human interaction at all times. We've recently moved from the farm to more urban existance, but the dogs are enjoying the new environment. Only a block from the Bow River and easy access to walking paths and off leash areas. The biggest thing the dogs are enjoying about the move is the pond in the back yard. So far all the plastic water lillies have been turned into toys. The stone turtles have been liberated and the pond is the best water bowl in a long time. All our gordons run together (except when girls are in season) making one big happy family. Enjoy your visit to our website, they are a big part of our family.